Patient and cunning, the sshian begin to expand their territories once again after uncounted centuries of degeneration and decline -- and they have little use for young "upstarts" such as humanity except as slave fodder. Arming themselves with jade and black iron, the sshian strike out to reclaim what was once theirs. Humanoid in a vague sense, the upper body of a sshian has a narrow torso and two muscled, grasping arms. Their three-fingered hands are long and claw-tipped, and their arms adorned with long colourful feathers -- vestiges of wings. Their narrow snouts are beaked and fanged, and a brilliant feathered creast rises over their slitted eyes and runs down their spine. The remainder of a sshian is covered in dense shining scales, including their serpentine lower bodies. Sshian prefer to let their slaves fight for them; when pressed into combat, they attack with baroque weaponry or -- if desperate -- bite for 1-6 hit points of damage. Their bite is venomous, requiring a successful save to avoid 3-12 hit points of damage; but they prefer to spit (with a 10' range) in order to blind. Three times a day a sshian's gaze will charm any who meet it. Sshian with greater than base Hit Dice are far from unknown; the coiled ones use ancient and delicately bloody rituals to grow in power and stature. Those of greater Hit Dice may acquire spellcasting ability. "The Draconitae, or Dragon-Stones, are a gem famed throughout the Empire for their luster and luminescence; indeed, so valued are these prizes that few care to mar their brilliance by re-shaping them. What is less known by the common fancier and unenlightened of the nobility is the nature and origins of these blessed gems. "What may be observed about the Draconitae? They have the shape and form of a spar of crystal, or Stone Ice as some call it; smooth of facet, transparent and durable. Unlike crystal, the Draconitas may possess a tinge of nearly any other colour, though most specimens tend to faintly smoky or golden in hue; more to the point, a Draconitas glows softly with its own inner light, concentrated along the edges of its facets into a incandescent brilliance. Some few, though less sharp of facet, all but rest within a halo of their own making. "All well and good; but what of their origin? This is a thing which few have concieved of, imagining the Draconitae to merely be a favoured prize of the great Dragons and thus named Dragon-Stone. To this I say nay; the Draconitas is indeed a product of the great beasts. "Truely, these magnificent gems begin existence as mere shards of crystal; the resemblance is a true one, for they are one and the same. The dragons, feeling some internal need, swallow the shards in mouthfuls, storing them within an organ much like that of the crop of an avian kind. Here the stones lie at rest, mingling with the energies of the great beast's breath and absorbing the essence thereof; till they reach a point of saturation, and are disgorged before the drake begins anew. "Alas, the sure purpose of the Draconitas I know not. The subject requires further research ..."
Well, here is an experiment -- a list of one hundred art objects and other small things, for dropping into a treasure hoard as-is or altered as desired. Nothing fancy, but it will hopefully get the job done? I hope that the file cooperates; this is my first time trying this sort of thing. Feedback is muchly appreciated! All living things must rest, as all things must one day come to an end. Some must be extinguished that others continue on. Thus will the new replace the old after the sleep of death. A hard lesson, but a wise one. With hard-won acceptance of this wisdom, Jie Chue bent his head and taught the harsh rest of autumn to harder steel. Reaping Harvest: Balanced yet oddly heavy, this hilt of this sword is wrapped in copper wire. In the pommel is set a high-domed cabochon of garnet, and a ragged leaf picked out in carnelian ornaments the blade on either flat. With a regretful smile, Jie Chue left the blade in the hands of a famed physicker, as a reminder that even healing may come with an unforseen price. Reaping Harvest is a sword +2. Once a day, the blade's bearer may drain the life-fluids from a victim struck by the sword, dessicating them and healing their own self by the amount of damage inflicted; if the injury did not kill the target, they are forced into magical sleep until harmed again if a save vs. spell is failed. The promise of life's renewal in turn became the too-bright sunlight and the heat-haze of summer. This truth Jie Chue forged with a faint smile at the deception of nature. Flickering Mirage: Razor-keen and gleaming of blade, this sword bears a hilt wrapped in gold wire. In the pommel is set a many-faceted topaz, and a sunburst picked out in amber ornaments the blade on either flat. Furthering the gentle deception, Jie Chue gifted the sword to a practitioner of magic, who fled those who sought to take his life with bitter curses. Flickering Mirage is a sword +2. Once a day, its bearer may grasp the bare blade, or press against a tiny barb tucked into the hilt; when blood is drawn, the blade's bearer may shift in a shimmering heatwave up to fifteen feet in any direction, so long as there is space for them to arrive, as if they were always at the arrival-point. Covered in scales of copper and bronze, a sirrush has the shape of an unnaturally large deer or antelope, the forepaws of a lion and hindfeet like those of a huge bird of prey. Its head, reptilian and bearing a pair of coiled horns, rests atop a long and slender neck; its whiplike tail coils and uncoils along its haunches. Sirrush lair in desolate, abandoned temples and other such ruins. A ferocious combatant, a sirrush attacks with claws and teeth; its claws inflict 1-6 hit points of damage, its bite 1-10 points. If truly enraged a sirrush will ignite in a nimbus of ruby-red flames, causing 2-8 hit points of damage upon contact with the fires and melting non-magical weapons that are used in combat against it. Sirrush are immune to damage from fire. Aside from more critters and items and (hopefully!) an increase in the number of spells posted, these are my currently hopeful plans. Subject to change, of course. - A nice long list -- maybe a hundred or so -- of "art objects", "small treasures" or whatever you want to call them. Most likely posted as a linked file to avoid the endless post from hell. - Some posts detailing semi-IC notes on things like alicorns. Sort of like pages from a journal or magic-user's notes. - Expanding out the Arcanist to more than the first three levels. Probably also better handled as a linked file. - Working on some kind of psionic character class. Because I want one, damnit. I've also been wondering if I shouldn't try to collect some or all of the material on here into downloadable files. It seems like a decent enough idea. Opinions much appreciated! If the winter months brought stillness, then what came on the winds of spring? Abeyance of death, and the renewal of life. Lifewarden: Finely balanced and weighted, the hilt of this sword is wrapped in electrum wire. In the pommel is set a leaf-green cabochon of jade, and a five-petaled flower picked out in rosy quartz ornaments the blade on either flat. When the sword was complete, Jie Chue brought it to an ancient shrine; on the worn steps, he gifted Lifewarden to a wandering medicant who had given up his violent ways. Lifewarden is a sword +2. Once a day, its bearer may cause the sword's blade to run wet with wine-dark sap. If this fluid is introduced into the bloodstream via the blade, it will cleanse the effects of a single poison or disease. As a pre-emptive treatment it will last only one hour. Densely-muscled reptilians nearly as tall as ogres, p'rarr are black-scaled with hints of blue, with four-horned, maned heads atop long powerful necks; heavy claws tip their fingers and toes, and a p'rarr may drop into a quadrupedal gait for greater speed when needed. Their muzzles are filled with sharp fangs, and their eyes are orange or gold. Ruthless and militaristic, p'rarr are conquerers and legalists, firmly believing in a warrior's right to seize and hold all in an iron grip. They are intolerant of most "weaker" races, but will show respect to an overwhelmingly superior force. Most p'rarr fight with weapons -- elaborate polearms and spears are preferred, as are sabres -- and their vicious bites, which inflict 1-8 hit points of damage. If pressed they bring their claws into play, for 1-6 hit points of damage per successful strike. Jie Chue forged many blades at the request of others. It was his calling, and his pleasure. But, after a time, he sought a different inspiration. For a year and a day, Jie Chue meditated in his gardens; his companions the growing and dying life around him, the snow and summer storms and the earth beneath. Renewed, he answered the call of his forge. Frozen Moment: Faintly cold to the touch, the hilt of this sword is wrapped in silver wire. In the pommel rests a domed snowy white opal, and a snowflake picked out in frost agate ornaments the blade on either flat. Frozen Moment was gifted to a passing young knight, that he might seize those scant moments in battle to parley and show his adversaries another path. Frozen Moment is a sword +2. Once a day, its bearer may strike with the weapon and -- rather than doing damage -- the target will be paralyzed for one hour. If a save vs. paralyzation is made, the target is still at -2 to all rolls for one hour. Backbones of the elemental court of Earth, gefirir are hulking, solidly built humanoids of soil and stone. Their bestial legs are furred with mosses, their feet massive stony talons; their torsos are armoured with stony, articulated "chitin", and their hands armed with great claws. A rack of crystal antlers crowns a leonine head, and eyes of burning amber judge all they encounter dispassionately. Elder gefirir possess manes of ferns and moss that dimly luminesce. In combat, should they choose it, gefirir wade in with their claws, dealing 2-12 hit points of damage per successful strike. A gefirir may also choose to summon clutching tendrils of earth and greenery within a 20' radius, for one of two effects: either holding opponents immobile (though not paralyzed) until the gefirir chooses to release the victims (or a successful Strength check at a -5 penalty is made), or lashing opponents with razor-edged crystals for 3-18 hit points of damage. These tendrils may be summoned every two rounds. An auizha resembles a wild canine in basic build -- but a canine with webbed paws, hooked claws, and covered in iridescent blue feathers instead of a furry pelt. Its eyes are featureless and golden. Equally at home in water or on land, the auizha can create full-sensory illusions -- often of a helpless child drowning or snarled in briars, when dealing with humanoids -- in order to lure in prey. Unless a save vs. spell is successfully made, the victim never senses the auizha approaching and it automatically has surprise. When attacking, an auizha uses its claws and bite, inflicting 1-3 and 1-6 hit points of damage respectively. Its bite is venomous, causing paralysis for 2-8 turns if a save vs. poison is failed; given the chance, the auizha will drag paralyzed prey into water to drown. A strange little creature, a mooncoil resembles a grey-scaled snake roughly 2' long. Snail-like, it possesses a pearly coiled shell the size of a man's two fists pressed together; it will hide in its shell when threatened by anything larger than a small cat, but if disturbed will retaliate. Mooncoils drain blood from their prey. A mooncoil's bite inflicts only 1-2 hit points of damage, with a poison that causes unconsciousness for an hour. However, twice a day it may cast a silvery magic missile as if a first level Magic-User. Resembling a hybrid between an ox and an antelope, immensely strong and a surprisingly fleet runner, the cartazon is notable for its tawny coat and thick mane, its three-hooved feet and its stubby tail. On its forehead rises a long, curved and wickedly sharp black horn, ringed towards its base like that of a wild goat or ibex. Though peaceful amongst other animals, the cartazon will abide the presence of its own kind only to breed and raise young; and it will not suffer the attention of humans. No adult cartazon has been known to have been taken alive, instead fighting to the death with horn and hooves. A magical weapon is required to harm a cartazon. A cartazon may carry 4500cn at normal speed, and 9000cn at half-speed. The barrow is a great circular tumulus, some 150' feet in diameter, and well overgrown by grasses and even small shrubs. Its internal chambers are all 15'x15', with rounded corners. On its southern side the crumbling remnants of a siltstone lintel can be spotted, the stone slab “door” having been unearthed -- and broken through -- by enterprising goblins seeking access to the barrow's interior. Immediately beyond the stone cap is a flight of fragile siltstone steps that descend for ten feet before opening into another stone lintel and the entrance to the antechamber. 1. Antechamber: Paved with roughly-dressed siltstone slabs, this chamber features two withered wooden statues depicting warriors in scale mail and bearing short swords and spears, their faces obscured by masks depicting some unknown predatory beast. The statues bear patches of gilding (worth 12gp total), currently being scraped away by two goblins [AC6; HD 1-1; hp 4, 3, 6, 2; Mv 90' (30'); Att by weapon; Dam 1-6; Sv Normal Man; Ml 7; XP 5]. Two more goblins are trying to pry up flagstones along the eastern wall in search of treasure cists. To the north lies an open lintel and archway. The goblins will drop their crude tools and attack with short spears when the chamber is entered. Each carries a handful of crudely-hammered electrum coins: 2, 6, 7, 5. After two rounds of combat, they will be joined by the goblins in (2). 2. Central Chamber: Like the antechamber, this chamber is paved with rough flagstones. Against the northwestern and northeastern walls rest rotted food offerings and pottery amphorae, remnants of a funereal meal. All three doors of this chamber are of age-weakened wood and not secured in any way. However, opening the northern door will trigger the 10' pit trap (1-6 hit points damage) that rests directly in front of it. Three goblins [AC6; HD 1-1; hp 4, 3, 6, 2; Mv 90' (30'); Att by weapon; Dam 1-6; Sv Normal Man; Treas 12, 10, 6 ep ea. 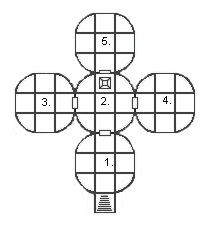 ; Ml 7; XP 5], including their leader (armed with a dagger +1 that sheds pale reddish light, one candlepower), are in this chamber planning their raid on the treasure in (4). They will attack the party in (1) after two rounds, though if the PCs seem too strong the goblin leader will attempt to parley and bribe the party with promises of treasure – and will hope that they get themselves killed by the earth spirit in the process. 3. The Sacrificial Dead: This chamber is roughly shaped, its floor packed earth stained a bright red by a layer of ochre. The red of the stained soil contrasts with the shreds of bright clothing and the pale bones of over a dozen skeletons that lay scattered and piled on one another in the chamber. Other than the remnants of their clothing, the skeletons wear copper burial jewelery – bracelets and torcs – worth a total of 200gp, 400gp to a collector. Three of the skeletons will animate upon being disturbed [AC7; HD 1; hp 8, 5, 6; Mv 60' (20'); Att 1; Dam 1-4; Sv F1; Ml 12; XP 10] and attack the party, pursuing them unless destroyed or turned. 4. Grave Goods: The door to this chamber has been half hacked away by the goblins. The chamber beyond is floored with earth, the burial hoard of Therex piled along the walls; much is decayed, such as bolts of once-fine figured wool cloth and stylized animal figures in bloodwood, and the remains of a two-wheeled chariot. Recoverable from the grave gifts are a set of six cups carved from red-gold amber (60gp each), three short swords, pommel-nuts and scabbards decorated with knotwork carved from tiger's-eye (42gp each), and a horde of hacksilver worth 352gp in total. Perched on one of the amber cups is the Gentle Sting of Juren. Once any of the treasure is disturbed, a least earth spirit [AC5; HD 1+1**; hp 9; Mv 60' (20'); Att 1; Dam 1-6 +stun; Sv C2; Ml 10; XP 23] in a roughly wolven shape will rise from the floor and attack the guilty party. 5. Burial Chamber: This chamber is lined with carved bronzewood pillars and tiled with well-fitted flagstones. Dead centre in the floor is a burial trench in which Therex lies, dressed in rusting scale mail and with copper beast-mask still in place. He clutches Gryphbane in his withered hands, and around his neck is a golden twisted-rope torc capped with amber-eyed wolfheads (430gp). Therex is a draugr [AC6; HD 3*; hp 21; Mv 90' (30'); Att by weapon; Dam 1-8; Sv F3; Ml 10; XP 50]; he will immediately animate and attack any who disturb him. If he is left alone, he will animate and begin to hunt those who have violated his barrow beginning on the next night. Gryphbane: A hammer +1, +2 against spell users, Gryphbane is an ancient weapon belonging to Therex of the Nightwolf House, famous in song and legend as wielded by that chieftain in his battles against the arcane Neu and their artificial servants. Many of the inhuman spell-wielders had the life crushed from them by the hammer's pitiless blows. A well-balanced weapon, Gryphbane has a spiralling haft of magically-hardened bronze and a grip of blackened iron wrapped in wolfskin. Its head is composed of two stylized predator's heads of bronze, picked out with gold and silver wirework and the eyes inlaid with amber; out of the gaping, fanged mouths of the beasts protrude the two massive heads of the hammer, cast from iron as strong and polished as fine steel. Similar to the common ghoul, draugr are withered, gaunt undead that hunt the living, especially those who have wronged them whether in life or in death; they are found within tombs and crypts, most frequently their own. Draugr have a feral cast to their features, and a faint bluish tint to their dead flesh and cauled eyes. Draugr may attack with claws and bite for 1-3 hit points of damage for each successful strike, or may attack with a weapon. Rather than the paralysis of ghouls, draugr possess a grave chill: for each successful attack, the draugr drains half of the damage dealt as an unholy energy that heals the draugr. Among the lowest ranked of the inhabitants of the elemental courts of Earth, these spirits take on crude shapes of humanoids or beasts. Their physical shell is composed of soil, clay, mosses, and tufts of grass, and two softly-glowing jade-green crystals serve as their eyes. Their eyes, and the organic gemstones within them that focus their energies, are their "treasure". Least earth spirits attack for 1-6 hit points of damage and stun the victim for one round if a save vs. paralysis is failed. They are immune to non-magical weapons, take one extra hit point of damage from all elemental sources save for earth, and regenerate one hit point per round when in contact with unworked earth. Prying Labyrinth Lord from the grip of the postal service. I've finally acquired a hard copy of Labyrinth Lord. I've wanted to take a closer look at this one for a while now, but -- though I dearly love how the digital world feeds my information addiction -- trying to read a pdf that long makes my neurons fry. Lulu really pounds my Canadian wallet dead and flat on shipping, so it's taken a bit of time to get a hard copy that's dutifully paid for instead of forking over money to Staples. Regardless, my copy is here now and I'll be contentedly sifting through it. I don't expect to jump ship from BEMCI any time soon, but I wanted to support LL -- and if I ever have the brass to actually "professionally" publish anything, LL is the system I think I'll be wanting. Though I'd just about discarded the notion of kitbashing an "emulation" of Final Fantasy -- by which I mean the first one -- the notion's been woken up again as I spend some time sorting piles of books, including many game guides, in preparation for installing a new huge bookshelf in my bedroom. Now, I'm certain that at this point there are screams of agony at the very idea ;3 But Final Fantasy is so stunningly (A)D&D-like in the original game, it continues to amaze me. You pick your classes (Fighter, Black Belt, Thief, or White [*coughClericcough*], Red or Black [*coughMagic-Usercough*] Mage), for your four-man party, and set off across the lands scouring monsters from dungeons, claiming artefacts, saving princesses -- and, might I point out, kicking the arse of Chaos. Literally. If you get party members slaughtered, you take them to a temple to be brought back to life -- or cast a ressurection magic, if you're high enough level. You find nifty magical items. And the first plague of monsters on your pathetic tyro heads are Goblins. So, yes, I'm tempted. Nyah. What would this kitbashing involve? That, I haven't decided yet. I have all the classes I would need (if I added the RC Mystic to my Red Box-ness); really, it would basically be writing up critters and spells and maybe a few magic items. I don't think I'd want to actually write a gazetteer of the world besides I'm busy writing a gazetteer for FFIV. Hush. On the other hand, too much inspiration and emulating and I'll be right out of Red Box land -- more and more of the unique FF critters and such are higher level -- and I don't want to do that quite yet. It is a quandry, I must say. I could conceivably make notes of changes in appearance or tweaking of stats of extant D&D critters, based loosely on FF. But that's just one option. It's also a completely honest statement that, arguably, FF is so clearly based on (A)D&D right down to mind flayers, mariliths, Bahamut and Tiamat that an "emulation" of that first game is essentially pointless to begin with. Gnarled and savage humanoids, rapeks are short and scrawny with calloused, roughened flesh and narrow tusks jutting from their low-slung jaws. More disturbing are the uncountable bone hooks, dense as steel and needle-sharp, that cover their bodies. Rapeks travel in swarms, attacking anything that looks like a suitable victim for robbery or eating. They strike with their barbed hands for 1-4 hit points per fist. A victim struck by both fists is caught by the hooks and is automaticly damaged each round until freed by a successful Strength check. A tribe of rapeks is led by a female chieftain of 2+2 Hit Dice and more plate-like barbs for an Armour Class of 2. The chieftain is served by attendants of mutated stock, 1+3 Hit Dice and bearing long spurs of bone on their forearms that cause 1-6/1-6 hit points of damage. Gentle Sting of Juren: A delicate and ornate magical construct of gold and copper and glass in the shape of a bee the size of a small human's hand [AC3; HD 1/4; hp 2; Mv 210' (70'); Att 0; Dam 0; Sv F1; Mr 12], the Gentle Sting may be used by its owner and activator as a scout within a 400' radius -- the construct will transmit a simple two- or three-word description of what it sees. However, its true purpose is the administering of potions. Any potion may be loaded into the glassy abdomen of the Sting with the correct command word. A second command word sets a trigger -- vocal command, a certain situation, after a given amount of time elapses, etc -- for the Sting to deliver its dose and to whom. When acting on its command the Sting plunges the fine platinum sting that gives the construct its name into the target, dispensing the potion within a round. It is conceivable that the Gentle Sting may also be used to deliver poisons. Long and lean with huge expanses of billowing wingsail, sky dragons are mottled and rippled in many shades of blue and white and storm-grey; some have highlights on their narrow scales the colour of sunset or lightning. Lairing on the highest of mountaintops and in enchanted clouds, sky dragons are some of the most patient and deliberate of creatures. A sky dragon's breath weapon is a line-shaped bolt of lightning and icy wind, 100' x 5'. If a second save vs. Breath is failed, a character is dazzled for the next six rounds at a -6 penalty to all rolls; this fades to a -2 penalty which lasts for four hours. Sky dragons have a 60% chance of talking, a 10% chance of being asleep, and (if capable) may cast three first-level, three second-level and three third level Magic-User spells per day. Stocky and blunt-snouted, hill dragons have scales in all the colours of the earth interspersed with larger plates resembling differing types of stone -- some may be pale as marble, others ruddy as granite. Hill dragons are found in deserts, hill country, and low-lying mountains as well as the occasional cavern. They are slow to jump to conclusions but implacable once roused. A hill dragon's breath weapon is a cone-shaped blast of dust and sharp particles of stone, 70' x 30'. If a second save vs. Breath is failed, a character's Armour Class is worsened by 4 due to the abrasion of the breath weapon's particles. Hill dragons have a 50% chance of talking, a 20% chance of being asleep, and (if capable) may cast three first-level, two second-level and one third level Magic-User spells per day. Ember dragons, almost feline in build and well-muscled, possess extremely variable colouration, ranging from rough coal-black scales with the merest hint of dull red to brilliant cherry mottled with flame -- and every mixture and combination to be found between the two extremes. Explosively violent, they are the terrors of the volcanic plains and the subterranean lands. An ember dragon's breath weapon is a cone of flame and burning magma, 80' x 30'. If a second save vs. Breath is failed, a character caught in the breath weapon -- and their equipment -- catches on fire, taking double normal damage until doused. Ember dragons have a 40% chance of talking, a 30% chance of being asleep, and (if capable) may cast two first-level and two second-level Magic-User spells per day. Slender, long-necked and slim-tailed, thorn dragons are built for eeling their way through the dense forests and overgrown jungle ruins that they prefer to lair in. Their name comes from their scales: mottled brown and rust-red, edged in green and rose -- and each one's tip drawn out into a long, curved thorn. Thorn dragons consider their forests to be their personal gardens and works of art to be maintained as they see fit. A thorn dragon's breath weapon is a line of flesh-eating, sticky sap-like fluid, 60' x 5'. If a second save vs. Breath is failed, a character caught in the breath weapon is affected as if under a hold person spell cast as a Cleric of the thorn dragon's level. Thorn dragons have a 30% chance of talking, a 40% chance of being asleep, and (if capable) may cast two first-level and one second-level Magic-User spells per day. So named because of the heavy plating of dense, ivory scales that contrast dissonantly with their extremely rangy builds, bone dragons inhabit old battlefields, abandoned graveyards and mausoleums, and wastelands of all stripes -- from desert to tundra and everything between. They are sullen and solitary in nature and quick to take offense at being disturbed, lashing out with jagged fangs and oversized claws. A bone dragon's breath weapon is a cloud of putrid, corrosive gas, 40' x 40'. If a second save vs. Breath is failed, a character caught in the breath weapon is at a -3 penalty to all rolls for the next six hours. Bone dragons have a 20% chance of talking, a 50% chance of being asleep, and (if capable) may cast three first-level Magic-User spells per day. I couldn't help myself. I had to post one. In the solo game, this microdungeon was placed under the shattered ruins of a recently-destroyed Magic-User's tower at the edge of a small village. (The tower was destroyed due to a spectactular and rather pink-and-green explosion.) The PC was asked to investigate after one of the locals was poking around and was attacked by the dragonflies. It could be placed just about anywhere, even as a lone poke-hole somewhere in the mountains or as a "getaway" accessable only by magic. Map scale is one square = 10'. 0. The Access. In the original a 100' spiralling staircase, accessed through a trapdoor, that had the usual trick stairs and other unpleasantness scattered along its length. The end of the stairwell is marked with a "trapdoor" icon on the map. Collapsing or heaving stairs require a successful Dexterity check to keep from falling down the next dozen or so steps, inflicting 1-4 hit points of damage. 1. Foyer. This irregularly-shaped chamber is paved with white granite and the walls are decordated with (rather tasteless) bright murals of humans hunting magical beasts. In the centre of the southern wall is an open passageway. Attempting to cross the chamber will trigger two brass dragonflies [AC3; HD 1/2; hp 2, 3; Mv 360' (120'); Att 1 bite + scorch; Dam 1 + 1-2 fire; Sv F1; Mr 11; XP 5] to be released from small hatches in the ceiling. In the centre of the chamber stands a lifesized bloodwood statue of a female human in elaborate robes and carefully-detailed jewelry. The statue is animated [AC7; HD 2+2; hp 12; Mv 120' (40'); Att 1 fist; Dam 1-8; Sv F1; Mr 12; -1 init. ; double damage from flame; immune to nonmagical weapons; XP 35] -- however, it will not betray itself or attack unless a living being enters the final chamber and then attempts to leave the complex. 2. Corridor. The floors here are still granite, but the walls are unadorned dressed stone. The door at the end of the corridor is of oak bound in iron; though the door is unlocked touching it will trigger a brass dragonfly to drop from a ceiling hatch and attack. 3. Study. A strangely homey chamber, with dusty rag-rugs scattered on the floor, faded tapestries hung on the walls, and well-worn furniture. Against the eastern wall is a sturdy oak desk scattered with books (the most notable of which are a seven-volume set entitled Being an Omnibus of the Behaviour and Habits of Wyrms); against the western wall rests a small cot, a stout wooden chest and the remains of a large shattered mirror. A screen of multicoloured glass beads curtains a doorway in the southeast corner of the chamber. The chest contains, in addition to many random trinkets: a satchel containing 37sp, 92ep, 85gp, and 30pp; and a tiny round box carved from slices of an alicorn, it's lid decorated with knotwork (100gp). The box contains a gold ring inlaid around the band with garnet flames and jade leaves (400gp). Disturbing the cot will unearth a hungry ivory scarab [AC4; HD 1; hp 5; Mv 90' (30') burrow 60' (20'); Att 1 bite; Dam 1-3 + drain; Sv F2; Mr 8; XP 13] tucked amongst the rumpled bedclothes. 4. The ... dearly departed? Floored in granite, the walls panelled in goldenoak, this chamber has a single feature -- a low bier in the middle of the floor. On the bier rests the dusty and skeletal remains of a human; possibly female, as the skull is surrounded by a cloud of long, dark hair. Around the shoulders of the skeleton rests a perfectly-preserved red silk shawl shot through with gold; this is Nasri's burning grace. River dragons are sleek and stub-winged, trailing overgrown wingsails like fins, with long jaws and tiny shining scales. Their scales are coloured in shades of grey and green and blue-green, thin and reflective like those of a trout or salmon. They are capricious and unpredictable, especially in combat. River dragons are found not only in rivers -- or any body of water of respectable size -- but on cliffside beaches and along the banks of major arteries. A river dragon's breath weapon is a line of hissing, thin acid, 50' x 5'. If a second save vs. Breath is failed, some portion of the character's equipment is irreparably ruined. River dragons have a 10% chance of talking, a 50% chance of being asleep, and (if capable) may cast two first-level Magic-User spells per day. A a young creature, a dragonet has more "childish" proportions (short extremities, large head, large eyes, etc.) than would an adult dragon. Its scales are softer, and of fairly nondescript colours -- pale tans, greys, creams -- which makes identifying the adult dragon subtype difficult at best. Though already very independent creatures, dragonets often remain with their birth clutches. A dragonet attacks with claws and bite for 1-3 hit points and 1-8 hit points of damage respectively. Its breath weapon, a line of caustic saliva measuring 30' x 5', obeys the standard rules for adult dragon breath weapons.